It's not easy being a pioneer in 1899-- especially when you're not just the only girl in your family; you are the only girl ever born to the entire settlement. May Amelia Jackson has seven older brothers and she's no "Proper Young Lady", everyone seems to want her to be one. She likes adventures, wearing overalls and climbing trees, going fishing, and proving that she can do anything her big brothers can do. This title is great for supplementing Frontier units, as it is packed with small details about rural life along the Nasel River (where May Amelia's family lives) as well as details about life in a bustling frontier city (nearby Astoria) at the turn of the century. May Amelia is a plucky little heroine, impossible not to like and readers will get drawn into her story from quite early on in the book. Publishers Weekly said that this Newbery Award winning book "is not to be missed." We agree! 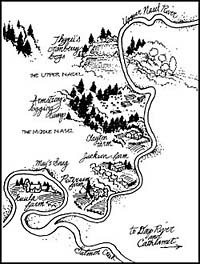 Create an issue of "The Astoria Gazette"
On a large poster board, have the student re-draw the map at the beginning of Our Only May Amelia, then add at least 20 events from the story onto their map. Inform them that a person can be shown in more than one place at a time, and that if the location is vague (ie: "in the river"), they should just depict the activity somewhere that is logical. Note: If you are going to have students do this project, you should encourage them to stop at the end of every chapter and think of any momentous things that they can add to their map. If they wait until they are done with the book, it may be hard for them to remember that many events. 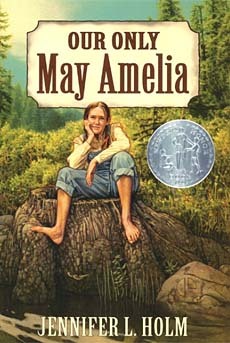 This book was an honoree for the prestigious Newbery Award for best children's literature. Click to see the full list of Newbery Award Winners. Or check out other books by this author Jennifer Holm. Her books are always quite popular with kids!